"Jackboots on Whitehall" has been labeled as the British "Team America: World Police," and while it's definitely not as vulgar it is an apt description because it is still a bit raunchy and just as politically tongue-in-cheek and insanely clever and inventive. Even a bit of Quentin Tarantino's "Inglourious Basterds" is sprinkled in, as well, with another rewriting of World War II history this time from the brotherly writer/director duo, Edward and Rory McHenry. The British army has assembled at Dunkirk, but the Nazis have hatched a plan to drill under the English Channel right into the middle of Trafalgar Square in London. The takeover comes complete with Nazi flags draped over Big Ben and Buckingham Palace. A small group bans together to thwart off the invasion, though, taking refuge in Scotland to protect Winston Churchill (Timothy Spall) from capture. A simple and kind-hearted rural man named Chris (Ewan McGregor) is the unexpected one to lead the charge. The film is cunningly satirical of large scale war epics by setting it to such an exaggeratedly small scale of using action figures and Barbie dolls to convey the action. It's also what makes it all the funnier with the characters' blank stares and expressions. The eyes blink and the mouthes move, but everything else for the most part is perfectly still, and it makes for a great comedic effect. 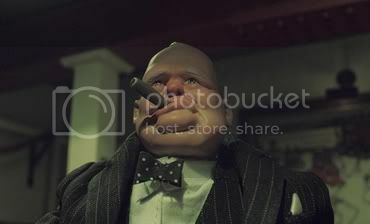 Winston Churchill, for example, constantly has a squinted expression and a fat cigar hanging from his lips. The excellent voice cast works, too, with the likes of Ewan McGregor, Rosamund Pike, Timothy Spall and Tom Wilkinson. Not afraid of stereotyping every nationality around, "Jackboots" pokes fun at the British, French and especially Americans with the character of Fiske (Dominic West) who relentlessly confuses Nazis for Communists. The Scottish get torn apart, too, as Scotland is referred to as a foreign, awful place with savage people. This leads to a parodied reference of "Braveheart" that explodes into a hilariously violent conclusion. Thanks to the movie's fun-loving shamelessness, it is shamelessly and undoubtedly entertaining. And just thinking about the painstaking efforts that must have been put into this film to pull off the level of detail in the animation that it does, that's an accomplishment in itself.